Today at TGS 2013, I was present for an extended fifteen minute gameplay trailer of the new game by Resident Evil creator Shinji Mikami: The Evil Within. I have good news. It was pretty darn scary. The trailer began more as a tech demo than anything else. There was a wall of stone that shifted into blocks which moved about and reconfigured into new shapes. It was... odd, to say the least. When the demo proper started, it showed a detective arriving at a large mental asylum. 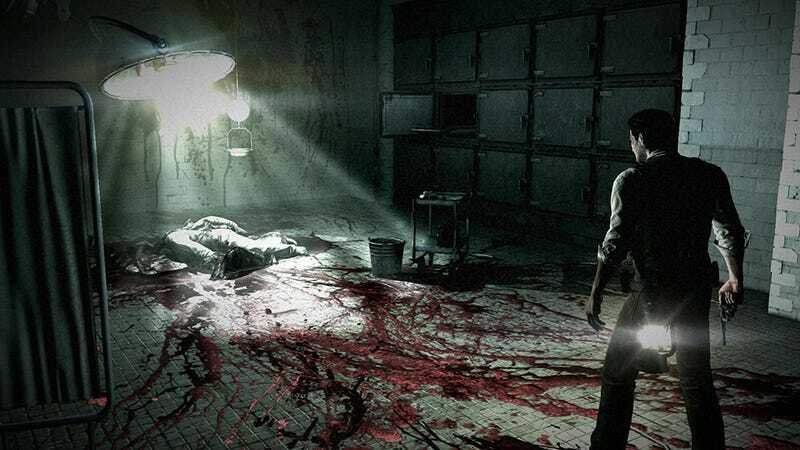 Then, after spending a minute or so on a lighting tech demo that showed off the outer design of the asylum, the detective entered the lobby to find bodies of several orderlies strewn about. After, going to the security room, the detective saw a group of orderlies on a monitor murdered by a hooded figure who seemed to be able to teleport. Then, after hearing a noise behind him, the screen went to black. The following sequence was an excellent example of survival horror. Alone and unarmed, the detective wandered through the bowels of the dilapidated asylum. In true Mikami fashion, he soon came across a masked, chainsaw-wielding maniac. In a frantic run, the detective barreled down the hallway towards the door at the end, but as he jumped through, he was clipped by the chainsaw. Limping through another doorway, he slammed the door and hid in a locker Metal Gear Solid 2-style. A few seconds later the chainsaw-wielding maniac burst through the door and continued down the hallway past the locker. The next section of gameplay consisted of clips showing the detective moving from bit of cover to bit of cover as he tried to avoid the chainsaw man. Eventually though, he was spotted and the frantic chase began again, ending with the detective leaping into an elevator moments before he would have been cut down by the chainsaw. The final portion of the trailer showed various disquieting rooms—like one resembling a giant meat grinder–and terrifying monsters—like a girl that looks like a mixture of The Ring's Sadako and a spider. In the end, I came out of the trailer feeling more than a little creeped out. The atmosphere of the asylum made it seem like there was something terrible around every corner and the chainsaw man seemed unstoppable. And as the detective was never even armed in this trailer, it was survival horror at its purest. Assuming this trailer was representative of the final game, it looks like the father of the survival horror genre has returned to his roots in grand style. The Evil Within is scheduled for Japanese and Western release in 2014 for the PlayStation 3, PlayStation 4, Xbox 360, Xbox One, and PC.